I’ve had the opportunity to play Last Will six times. I was taught the first time, had a refresher the second time, and taught the game the last three times to mostly, if not all, new players, and finally as a two-player against Lisa. And, even after that, I’m forced to admit that I have no idea how to be competitive. Strangely enough, that has me intrigued. It gnaws at me. An itch that compels me to scratch. 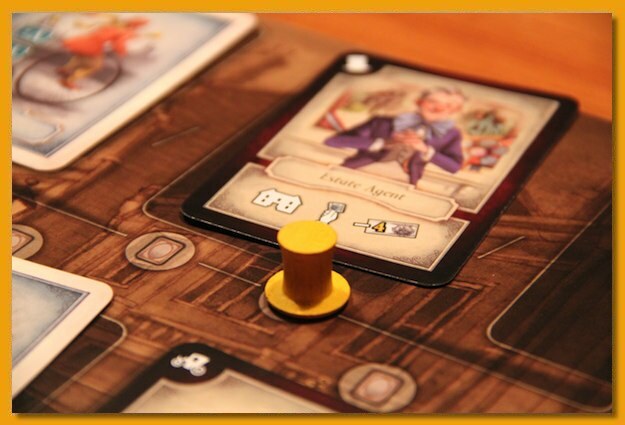 Last Will, designed by Vladimír Suchý, pits players against one another in a “Brewster’s Millions” style battle of being the most efficient at losing money. Att he beginning of the game, players are given a lump sum of money with the goal of being the first to go broke or to be the player with the least amount of money by the end of the game. However, it’s harder than it looks. Players are allowed to purchase property and to spend money on various items every turn but if you spend money to use the property, it doesn’t depreciate in value. Although properties help players shed money quickly during the game, at some point, players will need to shed those properties to go broke. There are several common boards and one personal board used in the game but at its heart, Last Will is a hand management card game. Players take turns planning their moves for the turn which not only establish turn order but also the number of cards they’ll be able to draw, the number of actions they’ll be able to take, and the number of “errand boys”/workers they’ll be allowed to place. As one might expect, the more actions and cards a player is allowed to place/take, the later in the turn order the player will go. Each turn, new cards are placed face up in an area of the board where workers can be placed to take them. The earlier you go in the turn order, the more likely you’ll be able to take the card. Other places on the board allow players to manipulate the price of real-estate either up or down depending on whether one is buying or selling property (buy high & sell low! ), take personal board extension, draw a card, etc. After all players take the actions afforded by their placed workers, all players spend the actions they secured for the turn, buying properties, spending money afforded by different cards, and eventually getting down to a strict hand limit. The better players are at locating cards that work well together, the faster they’ll shed money each round. All of the times I’ve played, I’ve tended to become distracted by the power of all of the cards. There’s really not a bad one in the bunch and when I see them flipped up on the central board I tend to always want to obtain cards that will pay off at some point in the future. My spending engine is late to the party and I wind up hitting my stride a turn or two too late. I really like the game and I’m itching to play again. However, I have found that the barrier to entry is pretty high given the number of rules and the sometimes confusing iconography. I’ve taught the game to gamers and non-gamers and they’ve been able to pick it up without issue but it just takes time to get through all the rules and various mechanics. There usually seems to be some stuggle with how many actions it takes to do things and what each kind of card does. Even though I currently play rather poorly, I still really enjoy playing and teaching the game. I have a lot to learn to get better at teaching it. But until then, I just need to play it to scratch that itch. 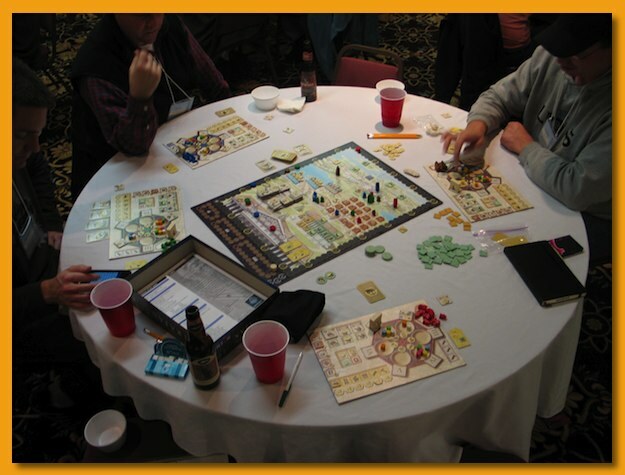 I always look forward to the Great Lakes Games (GLG) convention and this year was no exception. I shared a ride with a friend in my game group and after packing up the night before (there’s a library of attendee supplied games) we hoped in the car and made the 3 hour trip to Indiana. After a quick lunch, check in, and registration we were quickly hooked up with a game of Hawaii. Hawaii was announced in 2011 but didn’t seem to have much staying power with the cult of the new and quickly faded away. 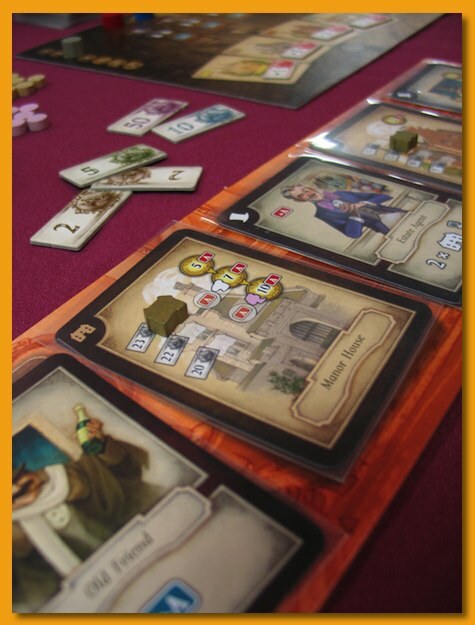 However, it’s a great game and still retains a high rank on BGG. I’ve not played the game extensively but I can’t imagine turning down a game. It’s a bit fiddly at the end of each round replacing the price tokens and setting up for the next round but get past that, and you’ve got a lot of fun. I approached GLG differently this year. This is my 4th year and I usually tried to play as many games as possible. Minimize downtime, short breaks for food, staying up late every night and ending a quivering mass of brain-drained goo. As I get older, I just don’t have the staying power I used to. My ability to absorb new games late at night (especially after a beer or two) after a few late nights is dismal. I decided to pull back on the reins of my game playing aggressiveness and decided to just let them come as they did. Less stress and more fun. That’s not to say I didn’t stay up too late (more on that later) but I didn’t feel the need to push so hard and in the end I enjoyed myself more. Having met up with lots of the same faces helps immensely. I’ve had the opportunity to meet up with the same rabid game players for 4 years now and it’s like an extended family reunion. I missed a lot of regular faces but had the opportunity to share games with some new ones too. After Hawaii, we took a little break, really got settled into the hotel, had a quick bite to eat for dinner and then jumped in on a table of Snowdonia that was just beginning to start. 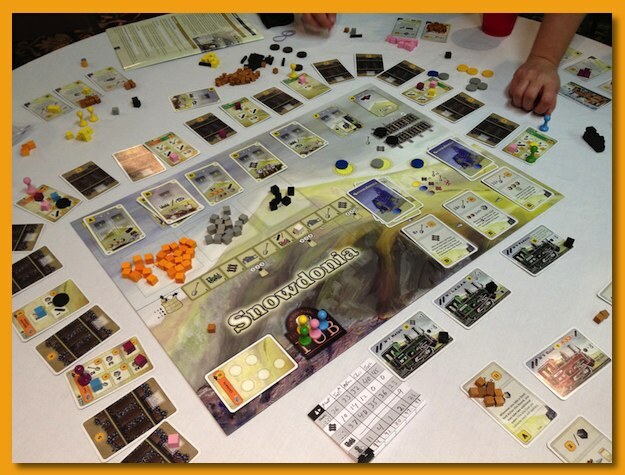 Snowdonia is a new game, just out at Essen. 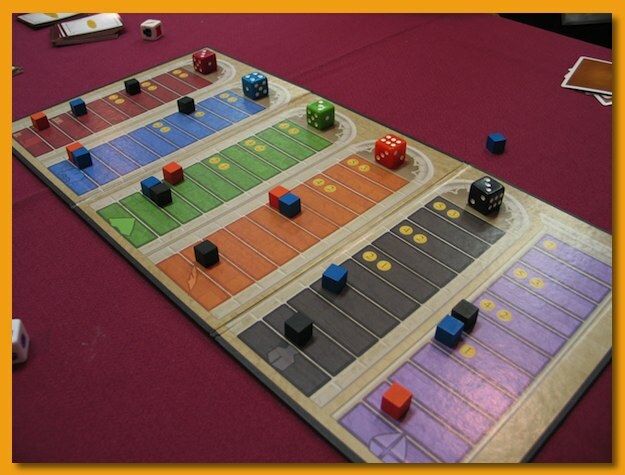 The game features worker placement mechanics for taking actions that clear land, gather resources from the production areas, and to convert them to rails to build track & stations and surrounding buildings. I really enjoyed the game. 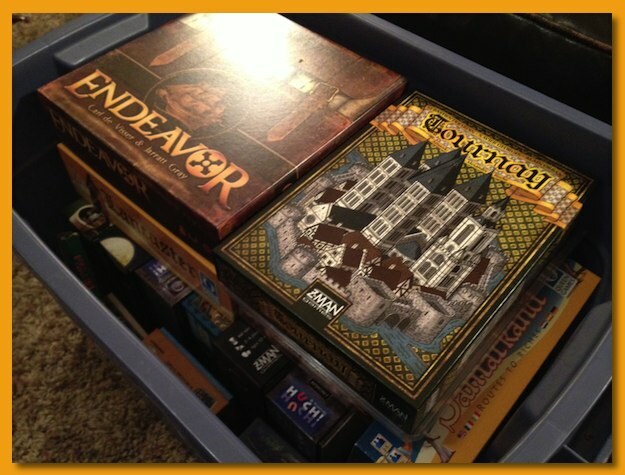 It was the only game of the convention that I played twice. Although I was new to the game, I taught it to another group of four new players the following night without issue. Easy to learn, easy to teach, and has depth. Nice job. The Snowdonia group broke up and another attendee just arriving wanted to get in on a game so we pulled out Last Will to get him warmed up. A game that features players trying to be the first player to lose all of the money they were given at the beginning of the game and ending with zero assets can’t be bad. Never has trying to lose all of you money so fun. The cards and iconography are a bit hard to follow but at least they’re consistent. Once it settles in, you’ll enjoy yourself. We finished out the night playing a game of Rattus as a light night ender. 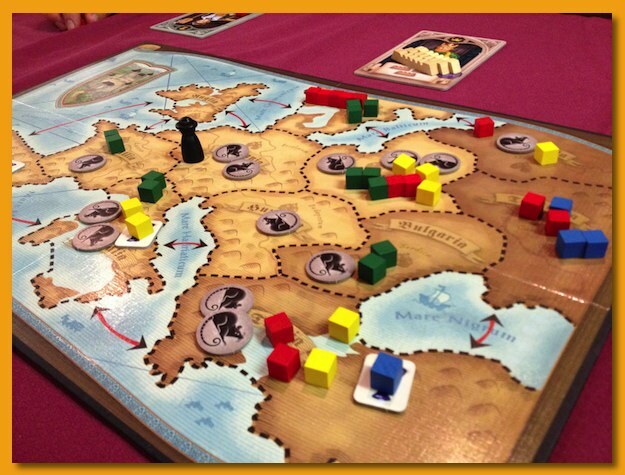 Rattus is one of those sleeper hits that many people have not played but those that have know there’s a good game in the box. I have both expansions and have no regrets for obtaining those. A new dice-game version came out recently and I’d be interested in trying that but I didn’t see a copy at GLG. Maybe next year. I made plans on Thursday night to play Merkator with someone who could teach it the following morning. Merkator was not a disappointment by any means. 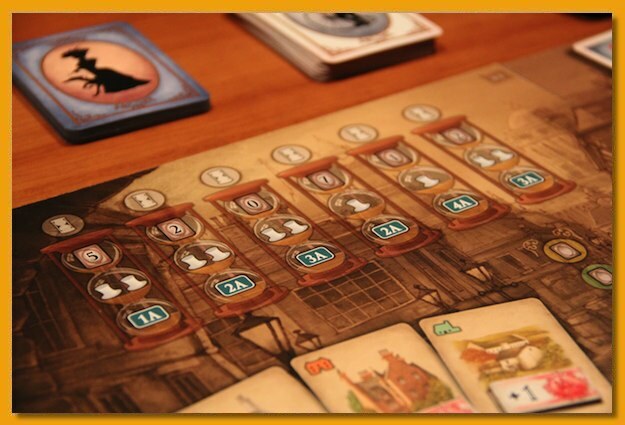 Although the game is “just” a straightforward pickup and deliver game with some twists, I enjoyed the laddering contract aspects and the “tag along” nature of the travel pawn to help fulfill your own contracts when others do activities that benefit you. I’m currently in the running to “win” an auction for a used copy and I’m hoping I come out on top. I sat in on an out of the box teaching of The Great Zimbabwe. The game started out well but it started to drag immensely about two-thirds in. There was a lot of AP problems and a lot of down time while players tried to figure out if they had the necessary resources and options to end the game. In the end we finally realized we’d ignore a rule that makes it much easier to keep the game going at an acceptable pace. I’d play it again but doubt I’ll pick up a copy. 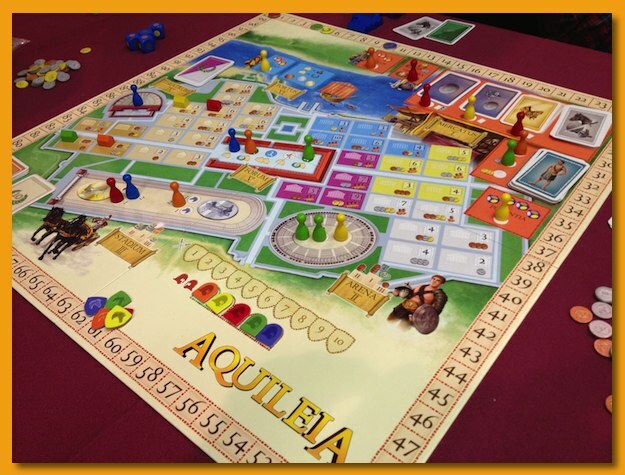 Next up was Aquileia, a 2011 release I’d never heard of or played. After a quick trip through the rules we got up and running in a five-player game that moved right along. 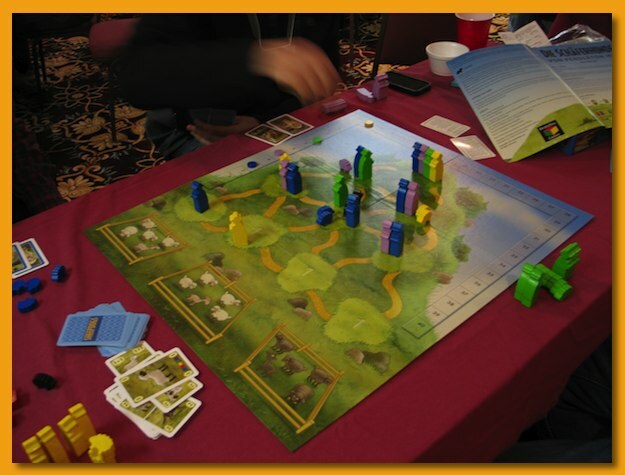 Although it is a worker placement game (there are *many* on the market) it had some fresh ideas with arena battles, horse racing, and building construction. I was pleasantly surprised and would gladly play again. 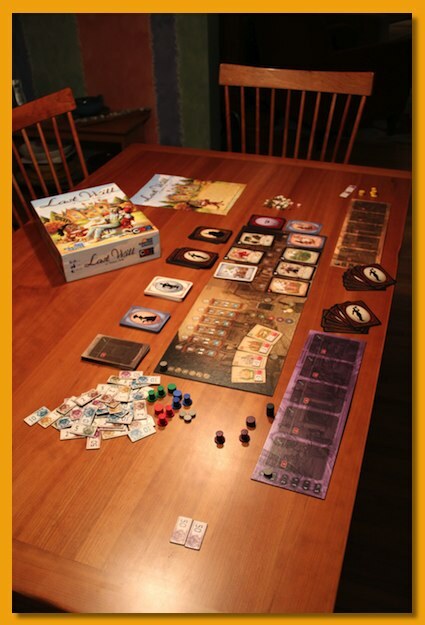 I got in a quick play of Scripts and Scribes: The Dice Game and was also pleasantly surprised. 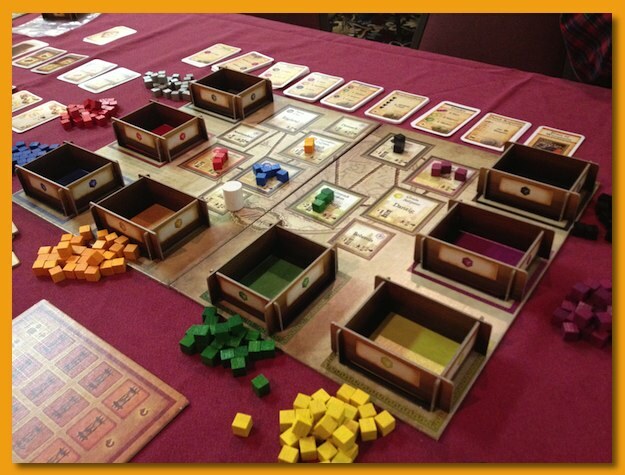 The card game is very streamlined and although I like it, it just doesn’t see the table. The dice game reinvents the situational decisions in a dice-driven framework. It’s fun but not something I would necessarily run out and buy. Next up we pulled out The Sheepdogs of Pendleton Hill and were greeted with some of the biggest wooden bits I’ve ever seen. The goal is to fill up pens with sufficient numbers of sheep and to drive them up a hill to a waiting & matching shepherd. However, you want to get as far up the hill as possible before meeting your shepherd to score the most points. Players use cards to perform actions but many of the cards require the players to perform an action that doesn’t involve their own pieces. This activity injects an overt screw-you/take-that nature to the game that you wouldn’t expect from the artwork on the cards. Light AND nasty. I’ll not be playing it again but I don’t regret the time learning it since it was so short. 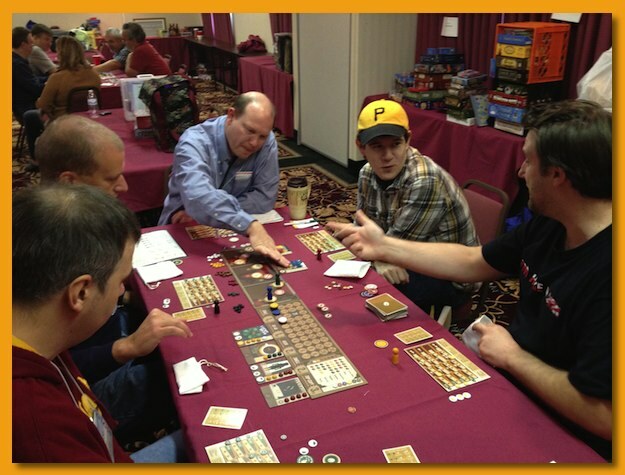 Next I taught Trajan to three new players. Trajan is a really good game from one of my favorite designers, Stefan Feld. 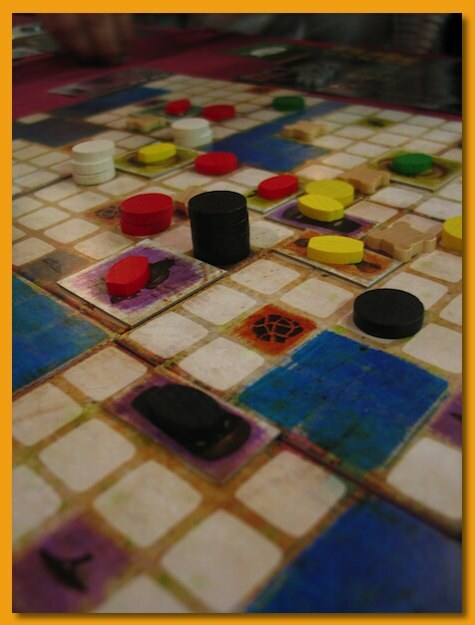 The game is a lot of mini-games rolled together with an awesome Mancala-rondel. Very nicely done Mr. Feld. I brought a copy of Trajan to the prize table and it went very early giving me a chance at some nice games, but more on that later. It’s expensive but well worth the money and the learning curve. After a few light cards games, and a replay of Snowdonia I headed up to my room around 2am for some much needed sleep. In the morning I taught and played Turn the Tide with four. Turn the Tide is so simple yet provides large numbers of groans and moans. Almost everyone I’ve taught it to remark how good such a simple game is. Try it out if you haven’t. For light warm up or down, or just family fun, it’s hard to beat. I taught Walnut Grove to two new players and wow, I knew the game could be brutal but was amazed at how difficult it was for one of the players to do much of anything useful or productive. There’s something wrong with a game in which it appears you’ve played as optimally as possible and you still failed to reach a score close to others. The game is supposed to represent living through the harsh conditions of the early west but that seemed a bit too harsh. Next up, I was taught Santa Cruz, a clever discovery game where players select heterogeneous hands of cards and use them to explore and discover treasures on several islands depicted on the board. 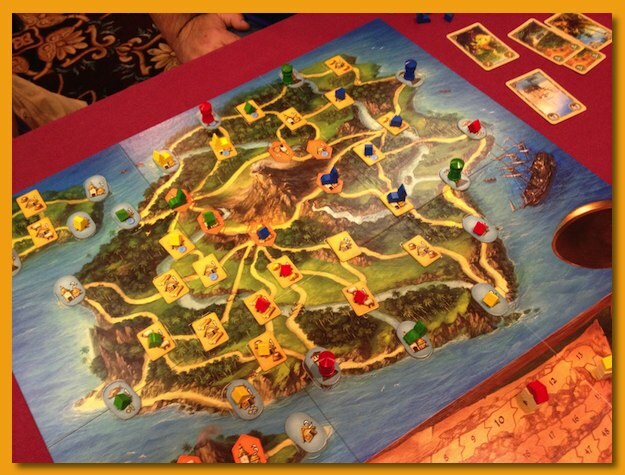 After discovering all of the treasure values on the roads, rivers, and ports of the island, players get the opportunity to play the game again with potentially a hand of cards used by another player for the first half of the game. However, in the second half you already know the values of the treasures and it’s and all out rush to grab up the good ones before others get there. Nice change of pace. Well done. 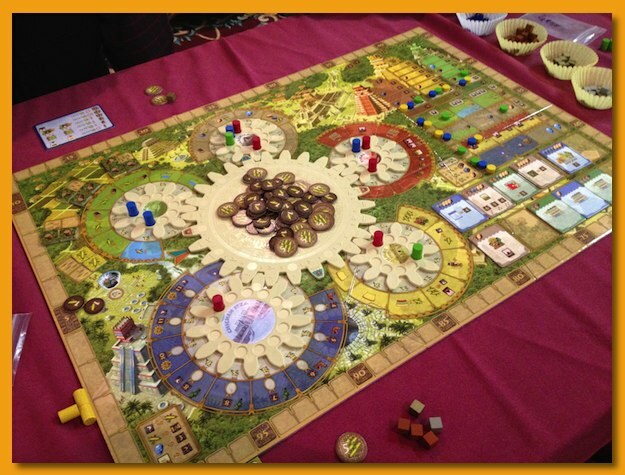 I’d been wanting to try Tzolk’in: The Mayan Calendar since the images of those wonderful gears started showing up on BGG. I was hoping I’d be able to give it a go at GLG and finally got my chance on Saturday evening. I’d read the rules and we started to walk through the setup when we got someone who had already played to give us a quick run through. We got going and had very few questions throughout the game. There are numerous ways to earn points through “tech track” adjustments, building monuments and buildings, temple adjustments, etc. At times my brain felt numb trying to figure out what a good move was. The mechanics were easy but unlike most games where I get a hint of how the mechanics can be used to drive towards points, I didn’t quite get it. I knew I was going to have a tough time “feeding my people” so I focussed on making that easy but totally got side-tracked optimizing that while missing opportunities to drive for more victory points. I need to play again and was surprised at how short it was. The look of the game gives the appearance that it’s going to be a long brain-burner but instead, it’s over in only 90 minutes. Great amount of game packed in those gears. I need to get a copy and play it again. The final game of Saturday night/Sunday morning was Myrmes. I shouldn’t have started it but looking forward to an opportunity to try it coupled with an offer to fill the 4th and final spot at the table I couldn’t resist. A few minutes into the rules I knew I was screwed. I just couldn’t focus and by the time the game started my brain went to mush, burning rubber smell and all 🙂 I was exhausted and played poorly. I should have gone to bed. However, I had retained enough of my faculties to see that there is a game in there and I think I’d probably like it. I’d gladly play it again when I have all of my mental capacities. 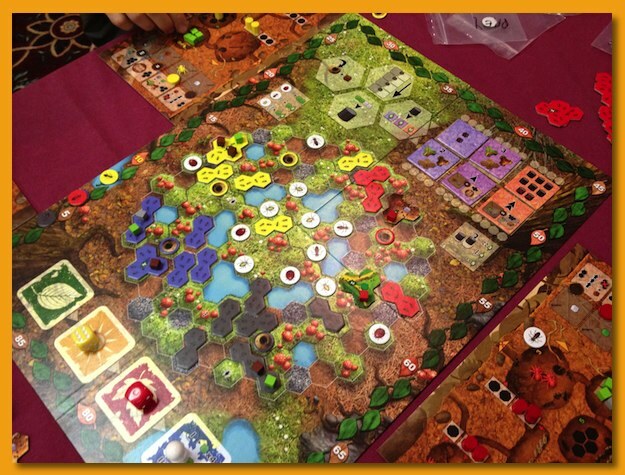 The final game of the convention was VivaJava. 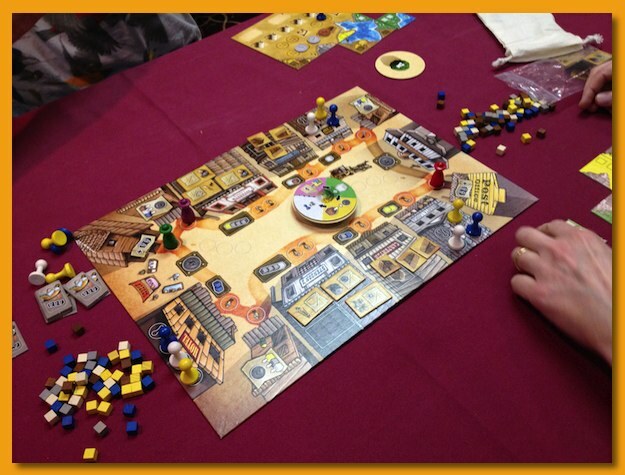 Funded by a Kickstarter campaign, VivaJava features a coffee theme where players attempt to construct craft-brews of coffee by collecting beans of various colors and periodically cooperating to produce blends of colored beans and pushing them into market. The blends take on a poker-like ranking (black beans are better than white beans) so a “flush” black bean blend would beat a “three of a kind” containing a lower-ranked color of bean. The higher ranked blends earn higher praise points from the customers. However, over time all blends lose popularity with customers and fall from their perches or are pushed out but hot new blends coming from researchers working hard in the lab. 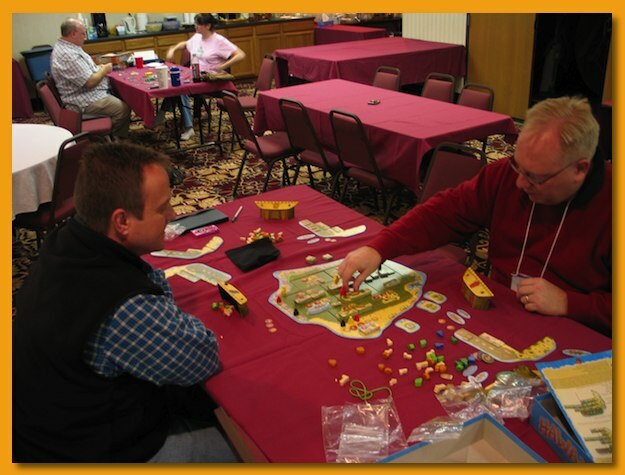 The game features a nifty forced but temporary cooperation between 2 or 3 players to produce the blend by pulling beans from their bags of beans collected over time. You won’t have enough beans to create a new blend every round and you’ll need to optimize your time during your non-blend turns to work in your research lab upgrading special abilities that help make stronger blends easier. I was completely blown away by the game. 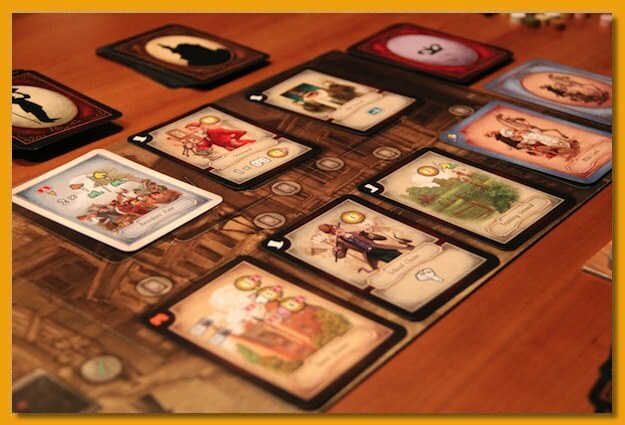 The fact that it plays best with 5-8 players, you can hardly go wrong with picking up a copy. Every year, GLG holds a prize table drawing where each person brings one or more games as a donation (one should be in shrink) and then each attendee gets a crack at choosing a game. When you pick one, the person that brought it gets to go next, etc. until everyone has selected a game. Then they go back through the list in exact reverse order. Any left over games after going through twice are taken by randomly drawn attendees. The second time through, I managed to walk away with a copy of Last Will and a copy of The Swarm so I’m very happy with the result. So, what are my must buys from GLG? I’d have to say Snowdonia, Tzolk’in: The Mayan Calendar, and VivaJava. I’m on the bubble with Santa Cruz. I liked it but the jury is still out if I’d want to own it. Dave Vander Ark does a great job with GLG and this year was no exception. I’m already looking forward to next year. I’m home now, exhausted but energized.